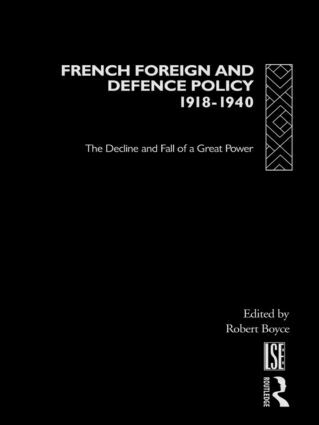 French Foreign and Defence Policy, 1918-1940 outlines France's strategies for protection and appeasement during this period and places interwar relations in a larger European context. Robert Boyce is Senior Lecturer in International History at the London School of Economics and Political Science. He is editor (with Esmonde Robertson) of Paths to War: New Essays on the Origins of the Second World War (1989) and author of British Capitalism at the Crossroads, 1919-1932: A Study in Politics, Economics and International Relations (1987). His book, Fatal Estrangement: Franco-British Relations from Versailles to Dunkirk, is in preparation.